In 2005, an American by the name of Robert Fleming was in Uganda when he noticed a very pregnant woman living in the street outside of his hotel. Being a kind and compassionate human being, Robert approached the woman to see if she needed help. In addition to being homeless and near term in her pregnancy, she was mentally ill. The woman told Robert her name was Sara. She was confused; in some moments, she had been a teacher. Other times, she had been a nurse. At no point during their conversations did Sara acknowledge she was pregnant. Robert continued to visit Sara each day, hoping to find her when she went into labor. It was the rainy season, and he knew that the child would not survive if Sara gave birth alone in the middle of the night. Which is exactly what almost happened. Robert found Sara in labor late one night. He helped her into his truck and sped to the hospital in Kampala, Uganda’s capital city. As soon as they arrived, Robert went to a nearby room to sleep. He awoke a few hours later—disturbed by an ominous silence—and immediately went looking for Sara and the baby. He found Sara in a bathroom, covered in blood, splashing water all over herself and the bathroom. There was no baby. Robert found the missing newborn—a girl—in a trash can, alive but suffocating from mucus in her mouth and nostrils. He grabbed the infant, umbilical cord still attached, swiped the fluids from her mouth, and rushed her to the nurses. This is where the story gets crazy. 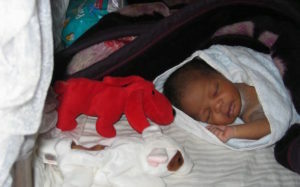 Once the baby was cleaned up, her umbilical cord removed, and her health confirmed, the doctor brought her back to Robert. Robert had never wanted children. An hour later, he was driving back to his hotel in his pickup truck, with a newborn baby in his lap. The women explained that he would need to get diapers and formula. They told him how to care for this tiny, motherless human. Robert called his mother. He told her what was going on, that he would stay in Uganda until he found a safe place to take the baby. Then he would return home. A few days later, the police knocked on Robert’s hotel-room door. They had another child. Three-year-old Bobo was the size of a six-month-old infant, with a broken femur and burns all over his body. He didn’t speak, didn’t even make any noises. Robert thought the child would die. But Bobo survived. Then came Viola; she was about eleven years old and had an infected wound on her leg. She didn’t speak either. Next, the police arrived with six-month-old triplets, sick with pneumonia and malaria. Robert soon realized that nobody was coming to rescue these children. He had two choices—abandon them and return to his easy life teaching tennis and traveling the world, or remain in Uganda indefinitely. That was thirteen years ago. Today, Malayaka House is home to nearly fifty children; Robert, Bea, the aunties (local women who care for the children); and a host of volunteers from around the world. Malayaka House isn’t just a halfway point for poor souls. It’s a home, a family. The children don’t get “adopted out.” This is their tribe for life. They become brothers and sisters. And, living in a country with over eighty percent unemployment for people under the age of thirty, Robert knew his kids needed more than just traditional schooling. In addition to enrolling everyone in private school, Malayaka House has developed several in-house businesses to provide vocational training for the kids as they grow into adults. These businesses also employ the adult children and generate income for the orphanage, in an ongoing effort to one day be financially sustainable. Malayaka House runs a pizza restaurant and a mozzarella cheesemaking business, an I.T. department, a permaculture farm system, a craft business, and a safari company. Viola, the eleven-year-old girl from the story above, is now twenty-four and the first to go to University. She is studying to be a social worker. Bobo, that malnourished baby with broken bones and burns across his body, is now a joyful, energetic, 5′10″ 16-year-old. And Malayaka—the girl who started it all—is a healthy, happy thirteen-year-old with a big, loving family and a future of limitless possibilities. Robert’s kindness and compassion toward one woman—thirteen years ago—has resulted in an entire community of healthy, joyful children with bright futures, and confident, financially independent adults who are creating positive change in Uganda. And it’s been good for him too.